A ‘Personal Budget’ is the amount of money required for the delivery of the SEN services set out in an EHC plan, where the parents or young person is involved in acquiring those services themselves. In their Local Offer, the Local Authority ('LA') should set out the services available that would lead to the use of a Personal Budget, how that funding would be made available, what the eligibility criteria is and what the decision making process would be. While a Personal Budget is optional for the child or young person, the LA is under a legal obligation to prepare a Personal Budget, when requested, during the preparation and review stages of an EHC plan. The LA is required to deal with each request for funding on an individual basis. In every case, the amount must be sufficient to cover the cost of the specific provision set out in the EHC plan. The Personal Budget may be used to secure education, health and social care services that are outlined in an EHC plan. It must be spent on services that are deemed to be in the best interests of the child or young person. 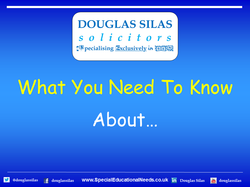 Parents or young people may appeal to the First-tier Tribunal in circumstances where there is a disagreement over a Personal Budget and this relates to the special educational provision set out in an EHC plan.